Fais rayonner ton français ! Parle français avec facilité et impressionne les natives ! Study French expressions on various topics with VocApp’s flashcards. Sound like a local, brighten your speech and impress your friends by using French idioms about life on the daily. These French expressions are easy and useful. 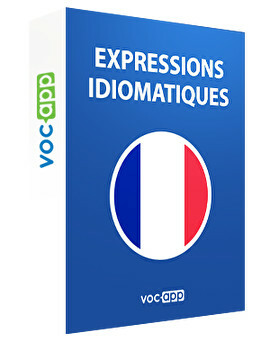 Learn over a hundred French idioms and discover their meanings with VocApp. We created a list of French idioms for you to impress the natives and improve your French. Memorize these French expressions quickly and use them on the daily basis easily. Here’s a list of French idioms that will brighten up your speech and make it easier to understand the natives! Learn these French expressions quickly and easily with VocApp. Have you ever felt that people around you are talking nonsense? Try learning French idioms and everything will start making sense. We prepared a list of French idioms about life for you to understand French better and sound like a local.